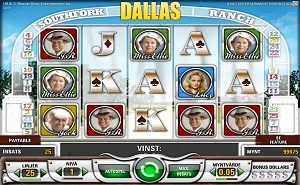 Dallas is an online video slot game from Net Entertainment that has been released in January 2011. This online video slot machine game has 5 reels and 25 pay lines. The theme of Dallas is inspired by the popular TV series Dallas (1798-1991) which chronicled the exploits of wealthy Texas oil millionaires. A lot of the plots involve dysfunctional family matters and shady business deals. If you are a fan of the Dallas TV series, you would surely like to play their online video slot version as you get to meet the Ewing family again including J.R., Sue Ellen, Lucy and Miss Ellie. Several online slot players would love to play for free first whenever they come across a new online slot game so that they can determine if they like that game enough to spend real money on it. Thus, whenever they see that a certain slot game is powered by Net Entertainment, they are certain that they can instantly play that game, without the need to download anything! The Dallas online video slot is a fun game to play at, especially if you liked its TV show equivalent and you love to get rich by digging up black gold (oil)! Dallas features free spins, scatter wins, a maximum coin jackpot of 100,000, a maximum cash jackpot of $50,000, and a very profitable oil-pumping bonus game! Famous for its quality graphics and sound effects, Net Entertainment has done well in incorporating the TV hit series Dallas into an exciting online video slot game. In Dallas, the symbols used are those of the characters in the soap. The background setting behind the reels is the luxurious Southfork Ranch. The overall graphic design of Dallas shows many different colors such as white, blue, green, purple, red and yellow. The opening background music you will hear when you start up this slots game is the one used from the TV series Dallas opening credits and you will see photos of J.R., Sue Ellen, Lucy, Ms. Ellie, and many more. The sound of the great outdoors, a whinnying horse and the chirping of birds is the constant background sound effects you will hear while playing the Dallas online slot game. When you spin the reels, you will hear short trumpet-like or even harp-like sounds that celebrate your wins! In Dallas video slot game, the regular symbols are the card deck symbols which include J, Q, K and Ace. Other symbols include J.R. Ewing, Sue Ellen, Miss Ellie, Lucy and Jock. The Wild Symbol is the Dallas Logo. The Dallas Logo (Wild Symbol) acts a substitute for all other symbols (except the Scatter symbol) in order to help you complete a winning combination. In Dallas, there are 2 Scatter Symbols – the Dallas Free Spin and the Bonus Dollar scatter symbols. Scatter symbols mean that they do not need to appear in a line (on an enabled pay line) for you to win. • The Dallas Free Spin scatter symbol can be scattered anywhere on the 5 reels for you to complete winning combinations, as long as there are 2 or more Dallas Free Spin scatter symbols that appear. Your winnings are calculated by multiplying the Dallas Free Spin scatter symbol combination payout (shown in the “Regular Payout Schedule”) by the total number of coins you’ve bet. If you hit 3 or more Dallas Free Spin scatter symbols, you will activate the Free Spin bonus game. • The Bonus Dollar scatter symbol only appears on the 3rd reel. If you manage to collect 5 Bonus Dollar scatter symbols, you will activate the Ewing Oil Bonus Feature game. Please note that the Bonus Dollar scatter symbols do not give you any winnings, but they allow you to enter the Ewing Oil Bonus Feature game. The first Bonus Feature game is the standard one – it is activated when you hit 3, 4 or 5 Scatter Symbols (Dallas Free Spin) and you are awarded 10, 15 or 25 Free Spins respectively. What’s more exciting in this bonus game is that every win you get during the Free Spin games are tripled (or multiplied x3)! The extra Free Spins you get are then added to the remaining number of Free Spins. During the Free Spin Bonus Feature game, you can be awarded an infinite number of additional free spins! When the Free Spin Bonus game is over, you are then taken back to the regular Dallas slot game, and all of your Free Spin game wins are added to your total win. The second one is the Ewing Oil Bonus Feature game. It is triggered when you collect 5 Bonus Dollar Scatter Symbols. The objective of the game is to invest your Bonus Dollar scatter symbols in different oil wells and then collect your profits. The more Bonus Dollars you invest in an oil well, then the higher the multiplier will be. The maximum multiplier is 5x. The number of Bonus Dollars that you have invested in an oil well determines the multiplier. Each oil well has a different amount of coins that you can win. The value of the coins in the Ewing Oil Bonus Feature game is based on the bets you have placed when the Bonus Dollars were won. You have to invest all your 5 Bonus Dollars in order to start pumping oil. You can still actually remove Bonus Dollars from an oil well and then add them to another one before the pumping commences. The more oil pumped out, then the higher your Bonus Prize. The Ewing Oil Bonus Feature game is over when the oil wells stop pumping. Do take note that the Ewing Oil Bonus Feature game can be activated even if you are currently playing the Free Spin Bonus games; however, the Free Spin multiplier does not multiply the winnings that you will win when you are playing the Ewing Oil Bonus Feature game. Dallas has 5 reels where you may bet on as many as 25 pay lines. The minimum bet is 0.01 and the maximum bet is 0.50 per line. You can wager from 1 up to 10 coins per pay line bet, so the maximum bet amount is 125.00 per spin. Online slots players are more inclined to stay longer at online slots games if they have an Autoplay function. Great thing that Dallas has this function with them! You can have the game help you spin automatically for you with the use of the Autoplay function. It is found at the lower left corner of the game screen. With the simple setting, you can choose a button (from 10 to 1000) which equates to the number of spins you would want the game to spin automatically for you. With the advanced settings, you can choose to Stop Autoplay on one or more of the following conditions: on any win, if Free Spins is won, if a single win exceeds the amount you specify, or if your cash decreases or increases by the amount you specify. After you are satisfied with your settings, just click on the Start button and the game will start spinning for you automatically.